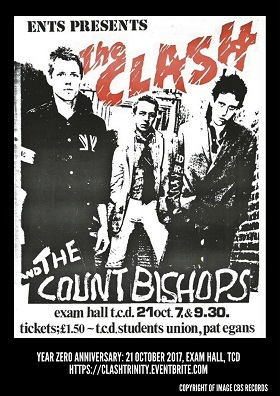 When The Clash played in Trinity College Dublin on 21 October 1977 they were fresh from a cancelled show and mini riot at Belfast’s Ulster Hall the night before. Bringing the white heat of UK Punk Rock to an Irish audience, The Clash played two sets of 35 minutes, inspiring attendees and kick-starting dozens of careers in the process. 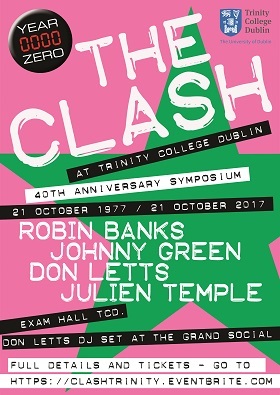 Trinity College Dublin is pleased to present a celebration of the 40th anniversary of The Clash’s two shows at Trinity College Dublin: Year Zero: Dublin. On 21 October 2017 a full day symposium featuring talks, Q&As, readings and screenings by original members of The Clash’s touring party, former TCD Student Officers involved in promoting the shows,filmmakers and close associates of the band. The event will be held in the Examinations Hall, TCD – the original venue for the 1977 shows. The day’s celebrations will culminate in DJ Set by Grammy Award winning filmmaker, DJ and Clash associate Don Letts at The Grand Social, Dublin. "What hit me, what happened, I still can hardly begin to calculate it"
We have an amazing prize for one lucky Clash fan - two free tickets and on-campus accommodation. The prize includes an overnight stay on-campus in one of our Front Square apartments, two tickets to the Yearzero: THE CLASH Anniversary Symposium in the Examination Hall and two tickets to the DJ set that evening in the Grand Social. To be in with a chance to win all of this visit our facebook here.